In an event hosted by Defense Minister Liberman, one lone solder explained why he enlisted and continues to serve his country and G-d.
Haredi soldier Nisim Blum from the IDF haredi Netzah Yehuda Brigade participated in a traditional celebratory dinner yesterday for lone soldiers and volunteers from abroad, at the sukkah of Minister of Defense Avigdor Liberman. Blum, a volunteer from the US, told his personal story. 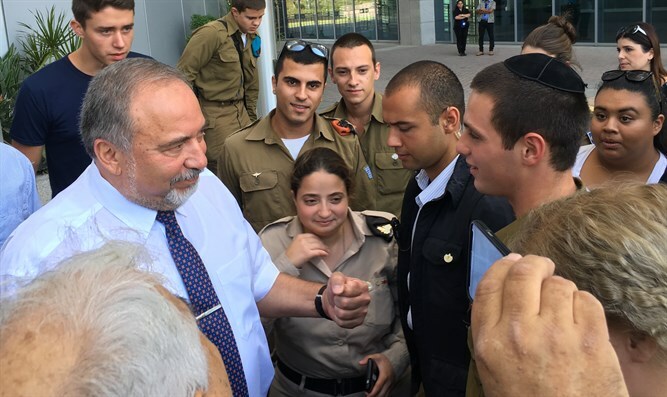 Liberman was moved by his story and even assured Blum that his American accent wasn't so bad.